'I'll stop doing it as soon as I understand what I'm doing. 'Somewhere between a historical account and work of philosophy, Socrates' Defence details the final plea of Plato's beloved mentor. Introducing Little Black Classics: 80 books for Penguin's 80th birthday. Little Black Classics celebrate the huge range and diversity of Penguin Classics, with books from around the world and across many centuries. They take us from a balloon ride over Victorian London to a garden of blossom in Japan, from Tierra del Fuego to 16th-century California and the Russian steppe. Here are stories lyrical and savage; poems epic and intimate; essays satirical and inspirational; and ideas that have shaped the lives of millions. Plato (474 BC-347 BC). 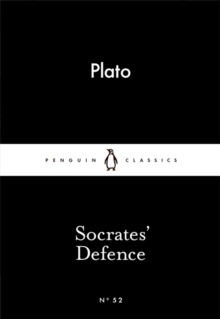 Plato's works available in Penguin Classics are Republic, The Last Days of Socrates, The Laws, Phaedrus, Protagoras and Meno, Timaeus and Critias, Theaetetus, Early Socratic Dialogues, The Symposium and Gorgias.